Strange Creature Caught On Cam In Canada Stalking A Moose. 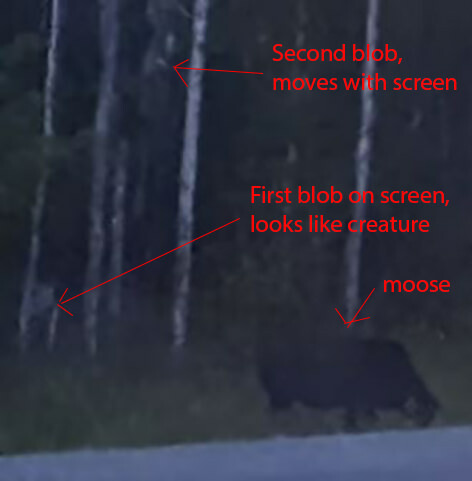 I was on the foxnews website and there is a video some man took in canada, this thing that comes out of the wood walking upright I don't know if its just maybe a huge wolf buts almost the size of the moose. I don't know how to post the link but is currently on that site. Edited by daphnerose, 03 August 2018 - 03:45 PM. good point Vlawde, looks like a bug. It's in the trees, it's coming! Interests:WOW, our dogs and hanging with good people! Life is short, enjoy it! It has antenna or horns or something. But it's not moving like a bug, plus it looks very far away. Defiantly a dirty smear or bird poop on the window of the car, if you watch it in full screen you can see another spot on the window above the first one slightly to the right. "Ghosts are not conscious entities, but emotional energy recorded in matter"
Interests:Meat Loaf(Actor/Singer not the food), Paranormal, Reading, Beading, Baking, Barbecuing, Cooking, Container Gardening and Music. My take on the video is the "thing" is a smear on the outside of the glass or something on the dash is reflecting onto the inside of the windshield. Well done Dazzed Dad, your video shows exactly what we were trying to say t was a smear on the screen. Another thing; If it was a ghost, it would've gotten much bigger to the point of hitting the car as it drove down the road. Obviously; It's a windshield smudge....like the one with the moose. The family in the car are obviously reacting to the moose, not the "monster".